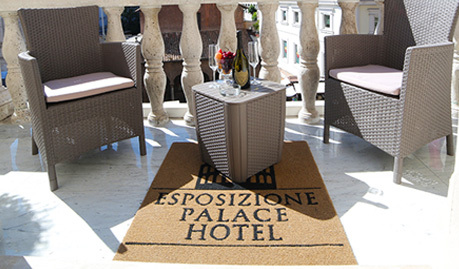 Esposizioni Palace Hotel has huge double bedrooms complete with private bathroom, finely furnished and of three different categories: classics, deluxes and prestiges, to meet specific demands and to offer our customers the best comfort and elegance. To celebrate Rome the classics and deluxes rooms, which have a surface of 23sqm, bring the names of the seven hills on which stands the Eternal City (Palatino, Aventino, Viminale, Esquilino, Quirinale, Celio and Pincio); while the prestiges, 32 sqm, are titled in honor of two of the greatest historical characters of Rome: Giulio Cesare and Cesare Augusto. 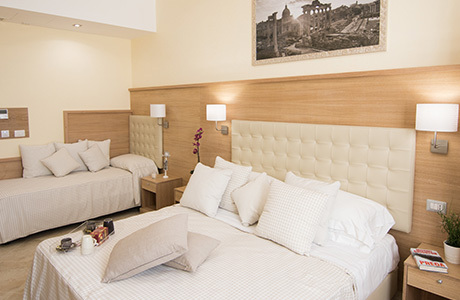 All rooms are equipped to accommodate both double and twin beds and, on request, they also have the option of a third extra bed. 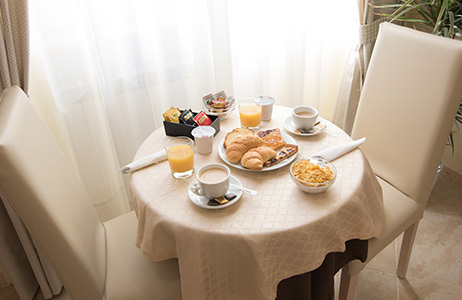 Each room provides breakfast service from 7 am to 10 am and features an LCD TV, Mediaset Premium on demand, free Wi-Fi, air conditioning, mini bar, safe, desk and kettle. For prestigious rooms, in addition to the services listed above, there is also a bathrobe, slippers and Nespresso machine. The Palace Hotel Expo also has no architectural barriers and offers to all its customers the following facilities: car park, currency exchange, laundry / ironing service, sightseeing tours and NCCs for Leonardo da Vinci Airport, Ciampino Airport, Termini Station and all the FS stations within the commune of Roma Capitale. Finally, our staff is always at your disposal for any special needs and requests.